Beluga is a small gastronomic temple in the center of Malaga. With a scrupulous process of selection, in Beluga we use only the best products from the land and the sea that come from the area and the country. On this solid base, in Beluga we pay homage to the culinary traditions of the Mediterranean, to our origins, to which we contribute our passionate and creative interpretation, using the most avant-garde culinary techniques, fruit of the evolution of the times and the technology. 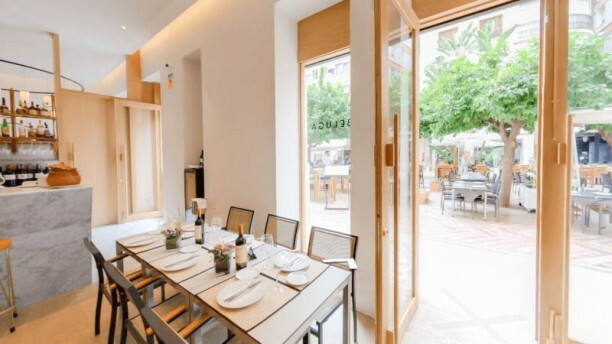 Beluga is located in the heart of Malaga, in the quiet and cozy Plaza de las Flores. I saw this in the fine dining recommendation category from TripAdvisor and it turned out to be an average restaurant with mundane food and disappointing ambience. Will not recommend if you wanted to experience fine dining in Malaga. realy good. I reccommend it for dinner. Good food, good service. Recommended! This restaurant was just good. Our appetizers were just OK, while the main plates were good, but could have been must better. I could not recommend this restaurant for anyone that is looking for excellent food. Disappointing service. The waiters never asked for our needs; we always had to call for them. To expensive. Delicious beetroot starter my husbands squid was rather bland. Excellent steak tartare and suckling pig! Followed by very good chocolate fondant. Very nice place to eat, only issue was I asked for a glass of red wine but it never arrived. Very special food, most definitely using best quality ingredients and a top chef. We found it a little overwhelming with the speed the waiters served us and especially the staters. After the starter was served everything relaxed and we enjoyed our evening. Croquetas y arroz de pato con calabaza y paté excelentes. Repetiremos. Steak - Filet was cold. 2 times. Quality bad. The table was outside the restaurant in a plastic tent with inadequate heating. The food was lukewarm when it arrived. The portions were quite small. A slice of bread each was provided at the start of the meal. We were asked if we wanted more bread at the start of the main course and when the bill arrived we had been charged extra for it. Staff were pleasant and attentive. Been there before and been very satisfied. Now.... bad heating, uncorrect serving on one of the plates (missed vegetables), all the porcelen had big slices, the duck was raw and had to be sent back to the kitchen. Dont think we are coming back. Food was delicious. The fish and rice soup is a must to try. We went to this restaurant twice on our stay in Malaga because we enjoyed the dishes and the warmth of the service. Although resteraunt wasn’t full the Service was slow to start but improved once order taken. Great selection of starters but limited selection of mains.